Workshop on Art Deco style and specialized finish know-hows. Learn about finishes, discuss techniques, illustrated with the work of famous design icons from the Art Deco period. Join us as BRAMALTA demonstrates how design professionals can distinguish their portfolios by creating a personal design experience for themselves and their clients. Designers will learn that they can offer their clients more than simply “off the rack” solutions through interplay of three easily changeable features: Cloth, Color, and Scale. With 5 different grounds in linen, cotton and blends and over 3,000 standard colors, designers can make Bramalta their own private design resource. With a fresh take on traditional patterns from diverse cultures Bramalta’s designs are easily personalized with quick turnarounds and low minimums through the harnessing of new technology. Bramalta is only limited by a designer’s creativity. Owner & Lead Designer, John Sacchetti Donis, will be on hand; light fare and refreshments will be served. Please join Carolyn Reed, VP and Chief Brand Officer of Sahco and Rubelli as she introduces you to the alchemy and splendor of new 2016 collection debuted at Paris Deco Office. Light refreshments will be served. Join Schumacher for an exciting presentation about the past, present and future of Schumacher. John Rosselli & Associates is proud to introduce Waterhouse Wallhangings & Fabrics as its newest industry partner. This beautiful collection contains many authentic reproductions of original wallpapers that were first used in this country, circa 1700- 1890. During these years, sea captains returning from trading in France, England, and sometimes China, brought back with them, as part of their cargo, handmade papers. These were designed by true artists who excelled in the creation and painting of wall hangings. Many of the designs were inspired by the valuable brocades and tapestries, which adorned the homes of the wealthy. For many years, founder Dorothy Waterhouse, visited lovely old New England homesteads, searching beneath layers of wallpaper or paint – or in attics, trunks, and old boxes – for fragments of original wall hangings. The results have been most rewarding, for many documentary papers have been found with colors and designs almost as true as the day the papers were made. Since many were created before the machine age, they were often painted completely by hand, stenciled, or by a carved wood block. The colors used were of home-mixed pigments and the designs the finest examples of grace in composition. So superior are these designs that they will always be in good taste. They rank with such find old furniture as Chippendale and Sheraton and with early works of art. During the ensuing years the collection has been enhanced with patterns that are more contemporary in nature, as well as Stripes, Strie effects and Textures, therefore, the Waterhouse collection has patterns that will complement any decor. Join us for a champagne toast, along with Daniel Recoder, Vice President of Product Development. Join Florense and Gaggenau in this VIP cooking demonstration. Gaggenau’s culinary chef will explore the cultural background of selected designers to present delicious bites prepared with the most advanced cooking technology. RSVP required, limited seating available. Join Eggersmann for a special Gourmet chocolate tasting. Join Adriana Hoyos as she introduces her TENTH collection, TEN. Product demonstration will be available, as well as a video of the new collection. Light lunch will be served. Join us as we showcase our latest fabric collections Anthem and Remix. Wine and cheese will be served. What’s new with hardware and furniture – join us to see the latest at Duralee. Refreshments will be available. Join Edelman Leather as we celebrate exotic, pure luxury with our glamorous new collections – Glitter Suede offers a soft, subtle dusting of metallic and the classic Authentic American Alligator is beyond sophistication. A bit of refined glamour, art for any room. 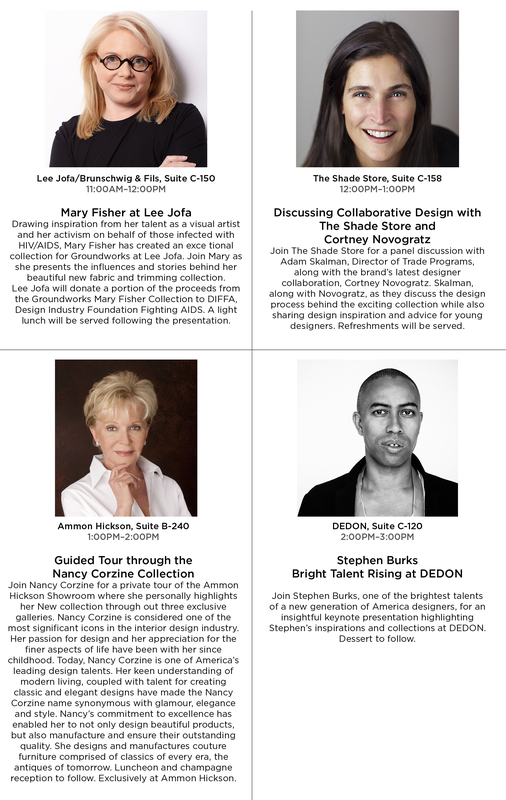 Join JANUS et Cie to celebrate the introduction of the 2016 collections. 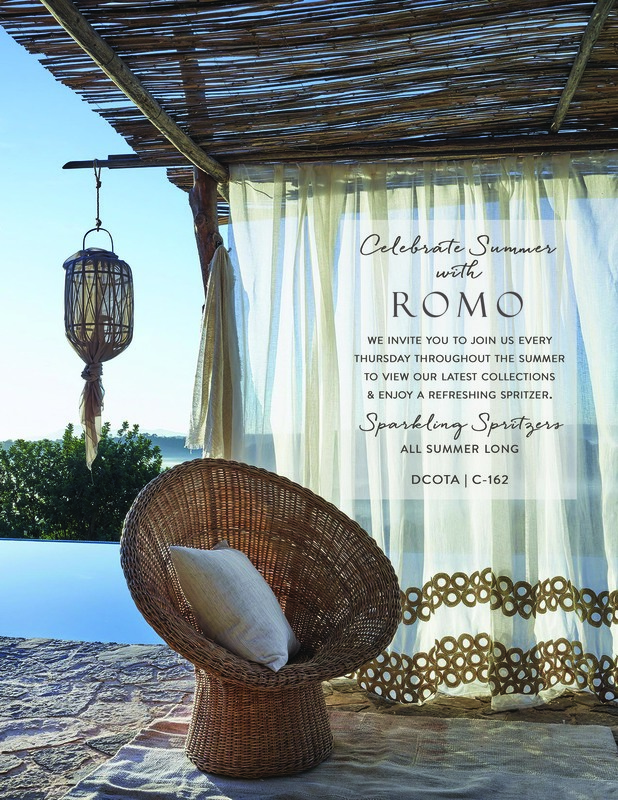 Be among the first to preview chic indoor and outdoor furnishings, textiles and accessories. Please join Pindler for a Winter Market Open House to see their current assortment of fabrics while enjoying light refreshments. Quadrille and China Seas welcomes you to our New Winter Collection. Come join us for some wine and light snacks, while participating in a raffle for one of our beautiful large sized totes. Please join us in the Resource Center and preview the brand new installations featuring Vivarini Murano, the most exquisite luxury glassware made exclusively in the island of Murano in Venice, Italy. 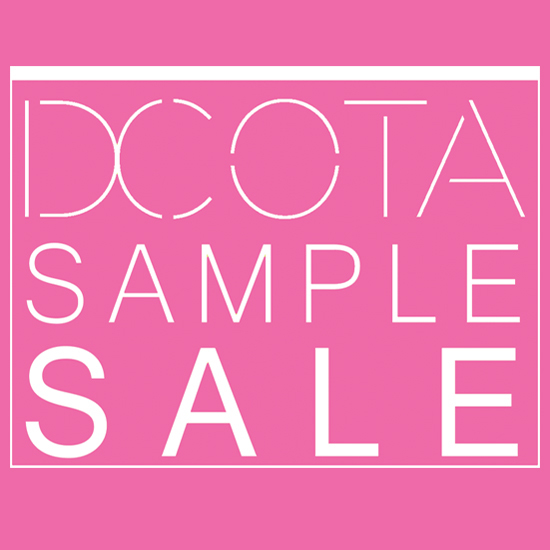 The DCOTA Resource Center will be transformed into the WinterMarket Media Lounge, where guests can take a break from the busy Market day and take a moment to recharge – literally. You’ll find an area to relax and several outlets and power strips to recharge your devices, along with magazines from our esteemed media partners. You’ll also have a chance to experience exciting displays from the Resource Center tenants: Bang & Olufsen, The Fish Gallery, PID Floors, Westminster Teak and the newest additions, Vivarini Florida Murano and Terrazzco.